Guess where I just came from! Some place called Nasugbu. What was I doing there? Well, I fell asleep on the bus coming from Megamall coz I was sooo tired. Stupid, I know. So: don't fall asleep on the bus, kids. Just don't. Ever. Or, if you do, make sure you don't have a Blackberry that's out of battery with you. It's not fun. Especially with the rain. We decided to go to the one in Megamall because Megann was coming from work near there. Spotted: the latest Manels Nation poster! (left) Megann with her top shoe picks. (right) Hezron and the munting umbrella. Obviously, this sale is a dream come true for me. If I had had more time, I would've gone to my favorite Manels branch in Trinoma; but, having just come from the Team Manila event in Rockwell, I didn't really have much of a choice. So, in true Wonder Woman fashion, I just got them all (parang Pokemon lang). What can I say? There's just something about Manels that I can't resist. Also, there's something about buying the perfect pair of flats in all of the available colors. Which is also the reason why Megann got her pick in both colors, as well. Haha. Shopping-buddy-in-crime! Fortunately, we have the same shoe size and both live in the South, so we can just borrow each other's shoes anytime. Chyeah. 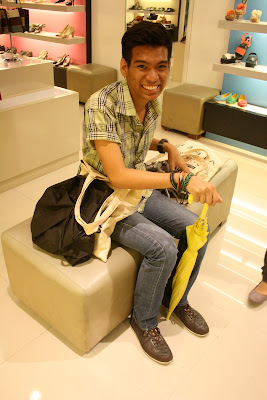 You're going to be blown away by how much I paid for them, too: only Php1,092 for all three coz they were at 50% off. And guess what? 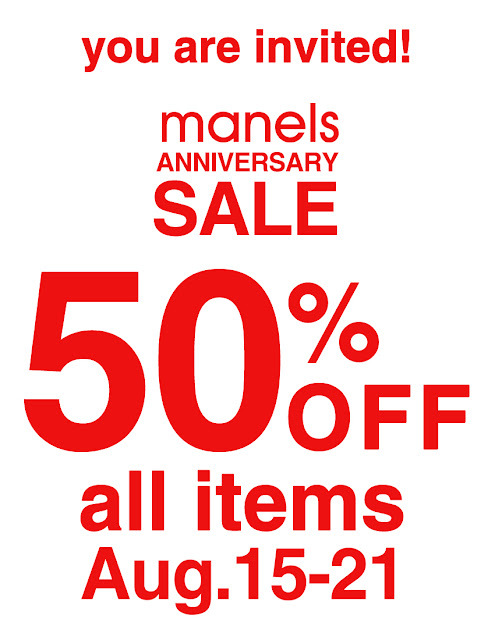 Since it's Manels' anniversary, all of their items will be 50% off for everyone starting tomorrow (Wednesday) until August 21! woah, thank god you got home safe! Anyway, ang dami ng cute shoes sa Manels! I remember when I was in grade school, dyan ako bumibili ng school shoes. Shucks, I need. to. go. Those Dorothy-like shoes... I will borrow them one day! I will build an outfit around it. Hahaha! It was fun despite the rain. Glad you're safe! Took me a while to get home too because I got stuck in Edsa for some weird reason when there weren't even people going on the bus. 'Til our next shopping trip. Or food trip. Or just a trip :P Hahaha! HAHAHAHA! NATAWA AKO SUPER DUN SA DESCRIPTION NI HEZRON "AND THE MUNTING UMBRELLA!"